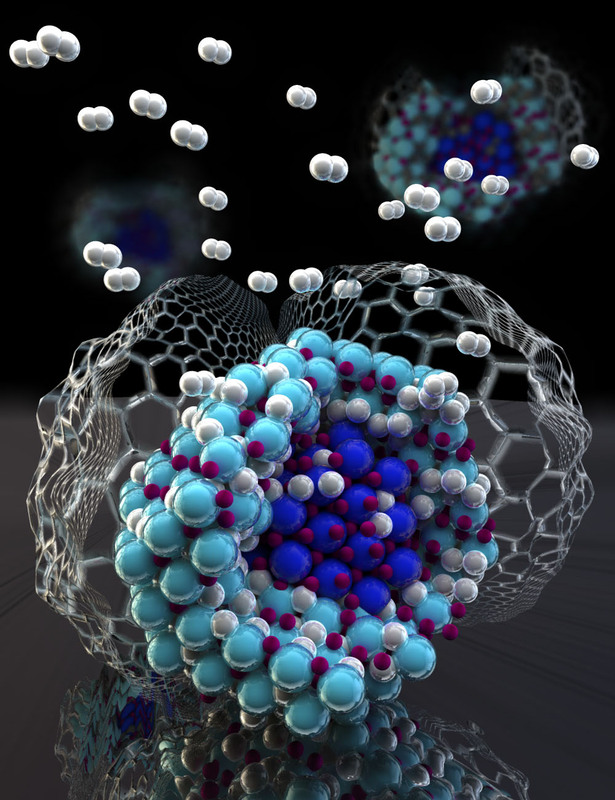 Ideas, Inventions And Innovations : Nanoconfinement: A Boon for Hydrogen Vehicles? Lawrence Livermore scientists have collaborated with an interdisciplinary team of researchers including colleagues from Sandia National Laboratories to develop an efficient hydrogen storage system that could be a boon for hydrogen powered vehicles. Hydrogen is an excellent energy carrier, but the development of lightweight solid-state materials for compact, low-pressure storage is a huge challenge. Complex metal hydrides are a promising class of hydrogen storage materials, but their viability is usually limited by slow hydrogen uptake and release. Nanoconfinement — infiltrating the metal hydride within a matrix of another material such as carbon — can, in certain instances, help make this process faster by shortening diffusion pathways for hydrogen or by changing the thermodynamic stability of the material. Hydrogenation forms a mixture of lithium amide and hydride (light blue) as an outer shell around a lithium nitride particle (dark blue) nanoconfined in carbon. Nanoconfinement suppresses all other intermediate phases to prevent interface formation, which has the effect of dramatically improving the hydrogen storage performance. However, the Livermore-Sandia team, in conjunction with collaborators from Mahidol University in Thailand and the National Institute of Standards and Technology, showed that nanoconfinement can have another, potentially more important consequence. They found that the presence of internal “nano-interfaces” within nanoconfined hydrides can alter which phases appear when the material is cycled. The researchers examined the high-capacity lithium nitride (Li3N) hydrogen storage system under nanoconfinement. Using a combination of theoretical and experimental techniques, they showed that the pathways for the uptake and release of hydrogen were fundamentally changed by the presence of nano-interfaces, leading to dramatically faster performance and reversibility. The research appears on the cover of the Feb. 23 edition of the journal Advanced Materials Interfaces. The Livermore researchers used a thermodynamic modeling method that goes beyond conventional descriptions to consider the contributions from the evolving solid phase boundaries as the material is hydrogenated and dehydrogenated. They showed that accounting for these contributions eliminates intermediates in nanoconfined lithium nitride, which was confirmed spectroscopically. Beyond demonstrating nanoconfined lithium nitride as a rechargeable, high-performing hydrogen-storage material, the work establishes that proper consideration of solid–solid nanointerfaces and particle microstructure are necessary for understanding hydrogen-induced phase transitions in complex metal hydrides. Other Livermore researchers on the study include Keith Ray and Jonathan Lee. The research is supported through the Hydrogen Storage Materials Advanced Research Consortium of the Department of Energy Office of Energy Efficiency and Renewable Energy, Fuel Cell Technologies Office.